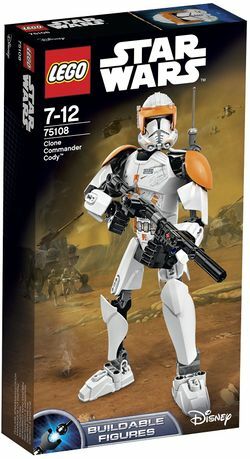 75108 Clone Commander Cody is a Star Wars Ultrabuild set released in 2015, depicting Commander Cody. This is a description taken from LEGO.com. Please do not modify it. (visit this item's product page) Lead the Clone forces with posable Commander Cody™! Lead the Clone Army into battle with super-tough Clone Commander Cody™! This amazing buildable LEGO® figure has everything you need to recreate intense battles from the Star Wars saga, including fully posable limbs, custom orange clone armor, and buildable blaster rifle and backpack. So suit up, grab your weapon and prepare for battle! Replay battle poses just like Commander Cody! Protect the Jedi against Empire attack! Facts about "75108 Clone Commander Cody"
This page was last edited on 18 August 2017, at 01:12.